Def Leppard singer Joe Elliott is continuing to work with Canadian singer Emm Gryner and a new photo is available. Emm posted a photo of the two together on her Twitter account and mentioned they are still writing songs together. Their album project will feature mostly music written by Joe on piano and vocals by Emm. Joe mentioned visiting Toronto last week when flying home following the end of the second leg of the current 2016 Def Leppard tour. The album project dates as far back as December 2011 when Emm posted about it a few times on Twitter. Emm supported Def Leppard in 2015 on their Canadian tour with her band Trapper. Her brother (and Trapper band mate) Frank also directed the three promo videos from the latest 'Def Leppard' studio album. News of this collaboration was first mentioned in a May 2012 interview with Vegas Rocks magazine. Not discovered until May 2013, where the interviewer misheard Joe saying 'Emm Gryner' and typed her name out as 'Andrina' (which sounds like AndrEEna). Joe himself helped to clear this up via a radio interview when a New York DJ asked him my question about the project. Read some of Joe's past quotes about the album below. You can also view the original error by the magazine. 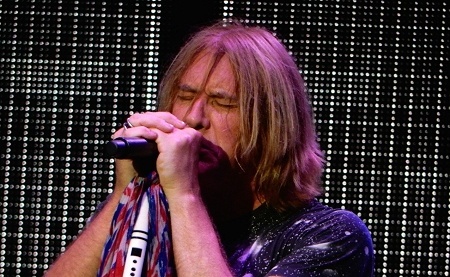 "Def Leppard just finished leg two of the tour Wednesday night in a place called Darien Lake which is close to Buffalo, Upstate New York. And so close to the Canadian border in fact, that I actually flew home from Toronto." "When I’m at home in Dublin, I’ve got a home studio because I’m usually making music, either writing for Leppard or Down and Out, my side project. I’m working on a duo album with a Canadian songstress called Emm Gryner. Me and her are attempting to make kind of a 2015 Hunky Dory album, kind of like acoustic glam rock. I scream my balls off on stage, so the last thing I’m gonna do is scream at some nightclub to order a drink. I watch a lot of movies." "There's a kind of a Robert Plant/Alison Krauss album on the go with a friend of mine called Emm Gryner. She's a Canadian songstress who's been in the business for years. I met her 16 years ago when she was moonlighting as a backing vocalist for Bowie. And she'd already had about four or five albums out. She's Canadian and she's been nominated for Juno awards. She's a phenomenal writer. Great voice. Good pianist. She does an amazing like Billie Holiday piano version of Pour Some Sugar On Me on an album called Girl Versions. And we've been threatening to work together for years." 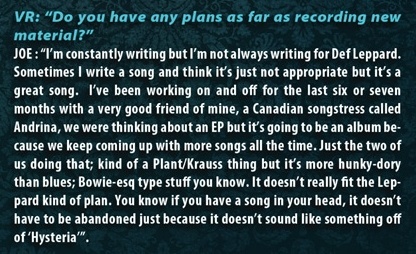 "But I'm also working on some new music with a girl called Emm Gryner. She's a Canadian songstress - wonderful talent. And me and her are doing a kind of a Plant/Krauss type record if you like but it's not country it's more kind of Bowie-ish, Glam rock kind of Hunky Dory era Bowie. Very, Very different to anything Leppard does." "But I have got a fifth thing on the go which is gonna come out, uh, sometime next year, is working with this beautiful Canadian songstress called Emm Gryner. We've written some songs together and, uh, I'm really excited about that because it's extremely different from anything I've done in my life."